My understanding is that VAT is something the seller pays based on the value of their sales. It's not something that the buyer owes (Although the seller can and usually does of course pass on the cost to the buyer). Is that correct? Interesting question, and for the first case it raises the point of whether the seller can in fact "Pay the VAT" for the buyer. Even so, the amount of VAT due is normally based on what the item is actually sold for, i.e. any discount applied in any way reduces the VAT that is due, being 16.66% of what is actually paid. I wonder how HMRC see this? As long as HMRC get the VAT due on the final sale price, I doubt they really care. The fundamental problem here is the retailer describe it as "VAT Free", when what they actually mean is "a discount *equivalent to* being VAT Free" - that's what the bigger retailers (the ones with tax accountants and lawyers) tend to put in their small print. It is not VAT free, and should not be advertised as such. 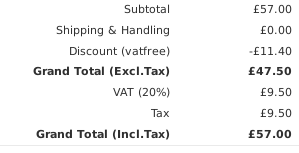 It is discount equivalent to VAT. It's marketing rubbish. As soon as HMRC would ask what is going on, the supplier would show their receipts which show the correct amount of VAT charged. Then all that is left is their factually incorrect marketing strategy, which HMRC is not interested in.